What is there not to like about San Francisco? Colorful old homes, vibrant clubs, absurdly good restaurants both affordable and overpriced, the best California wines, Ghirardelli chocolate, the sea lions on Pier 39, the ferry to Alcatraz, the Golden Gate bridge, and the World Champion San Francisco Giants who play in a wondrous bandbox perched on a fresh water bay that is 48 miles long and 12 miles wide. I’d bore you to death trying to relate what Little Lee and I found to be so wonderful about San Francisco. So I won’t. I will, however, point out one place all Baseball Historians will enjoy. Lefty O’Doul’s Restaurant & Cocktail lounge calls all visiting baseball fans to its leather banquets and mahogany walls at 333 Geary Street. You are greeted by two 1940-era signs above the door, one spelling out the business name in green baseball cursive, the other with black and white art of a young Lefty batter in the follow through of his swing. Step into the past, my friends. By my count, 263 framed photographs line the walls. (Others have reported as many as 400.) There is a piano, a 50 foot bar, a cooking line kicking out grade-A “guy food” and a dining room that seats 200+. The framed objects include original items like O’Doul’s Sporting News 1945 Minor League manager of the Year Award, a game used San Francisco Seals jersey, autographed photos of just Lefty, and other photos with ODoul standing with members of the Oakland A’s of the 70’s. (Let’s not forget that Bay area fans have TWO great MLB traditions.) There is a personalized and signed photo of William Frawley, the “I Love Lucy” co-star. (O’Doul socialized in the orbit of Joe DiMaggio & Marilyn Monroe. Frawley and countless other Hollywood stars were his friends.) 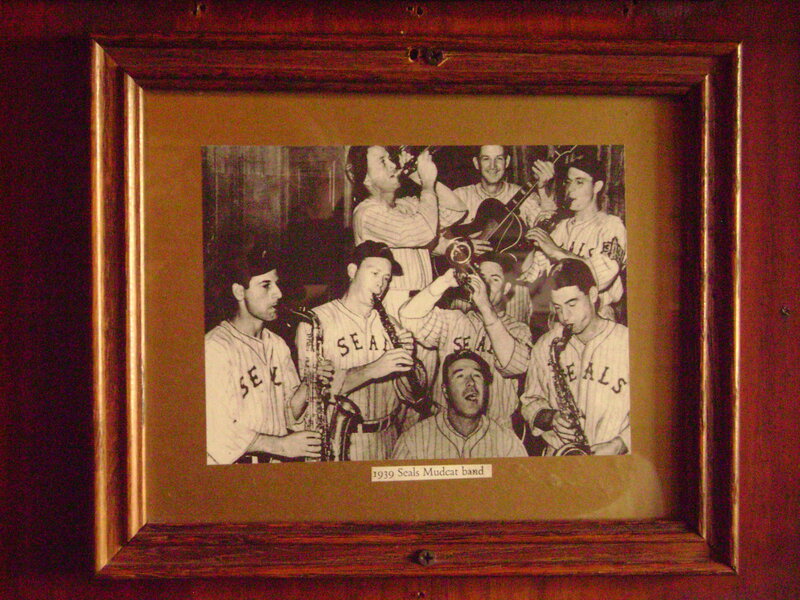 There is the 1939 Seals Mudcat Band. There is O’Doul with a young Mantle. There he is with Joe DiMaggio, arriving in wartime Korea. There is a giant panoramic of a game at a Japanese Stadium. Then there is one magnificent photo of a touring team that went to Japan in the 30’s, framed with the autographs of those 20 stars including, O’Doul, Ruth, Mack, and Gehrig. It’s a dazzling environment you shouldn’t miss. Click on the album and page through the photos I took at O’Douls. Even better, read David Hoekstra’s 2008 piece in the Chicago Sun Times celebrating the 50th anniversary at this site: CLICK HERE. Lefty is the essential San Francisco Baseball Legend. Born there in 1897, he played in MLB for the Yankees, Red Sox, Giants, Phillies and Dodgers. He had a .349 Lifetime B.A., winning the 1929 and 1932 NL batting titles with respective averages of .398 and .368. Unfortunately, he only had 3,264 official at bats, not getting the PT needed to make a run at the HOF. It happens. See Riggs Stephenson. Before retiring he traveled to Japan, hanging with Ruth & Hirohito, helping to introduce baseball to the Far East. After hanging up the spikes he managed the San Francisco Seals for 17 years. In 1935, he managed a young Seal named Joe DiMaggio, who batted .398. Two years later he managed brother Dom. THE PCL was star studded. O’Doul’s players competed against against Rip Collins & Hugh Casey of the LA Angels, Bill Rigney, Smead Jolley, Joe Gordon and Spud Chandler of the Oakland Oaks, Vince DiMaggio and Bobby Doerr of the Hollywood Stars, Eddie Joost , Max West and Mark Koenig of the Mission Reds, and Max Bishop of the Portland Beavers, to name but a few. Recognized as one of the game’s great hitting instructors, O’Doul mentored hundreds of future major leaguers, while amassing over 2,000 minor league wins as a Manager, a total surpassed by just 8 others. This entry was posted on November 26, 2010 at 3:42 pm	and is filed under BASEBALL. You can follow any responses to this entry through the RSS 2.0 feed. You can leave a response, or trackback from your own site.